Gamers love an LED, right? 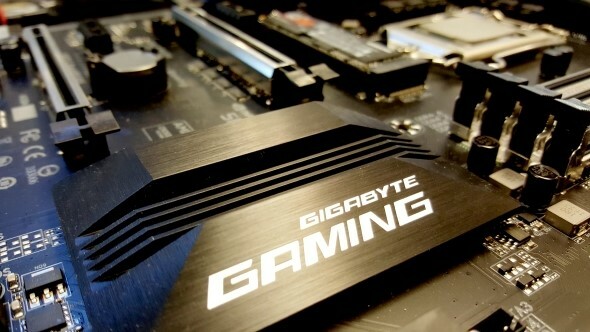 In my head that’s how the design meeting went for Gigabyte’s Z270X-Ultra Gaming, the first moderately affordable Kaby Lake motherboard we’ve seen from the Taiwanese mobo heavyweights. Looking for something to plug into your new motherboard? How about one of the best gaming mice around today? So far we’ve seen a couple of Kaby Lake motherboards pass across our testbench, from Gigabyte’s main rivals, MSI and Asus. Both those previous boards though were from the more expensive end of the market, with both around the $200-250 (£200-220) mark. This Gigabyte version though, dazzlingly LED strewn though it is, is a far more reasonable $165 (£150). 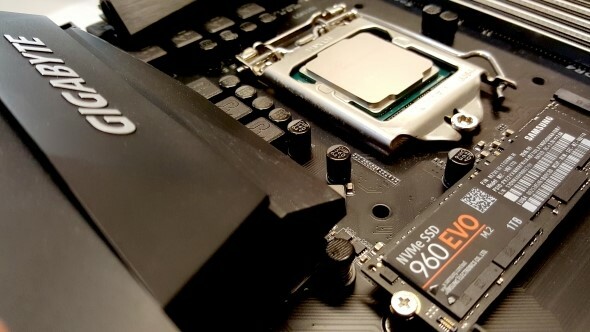 So what are you missing out when you opt to go for a cheaper version of Intel’s top-end Z270 chipset? Well, with so much performance dependent on the processor and the attached graphics card the motherboard is no longer a definer of PC speed, now it’s just about the feature set and the price. Tap away on the jump links below to get to the different review sections. This board is still rocking the top Kaby Lake chipset, despite its lower price, which means you still get the all the standard Z270 goodness. So that’s the same LGA 1151 socket and overclocking, Optane and DDR4 memory support. The Ultra Gaming is also set up for PCIe-based storage too, though as it’s a lower-caste board you only get a solitary M.2 connection for your NVMe SSD. The best SSDs around right now are M.2 based, but few gamers are likely to stretch to a pair of them for a standard PC system… though think of the RAID speeds. Mmm. 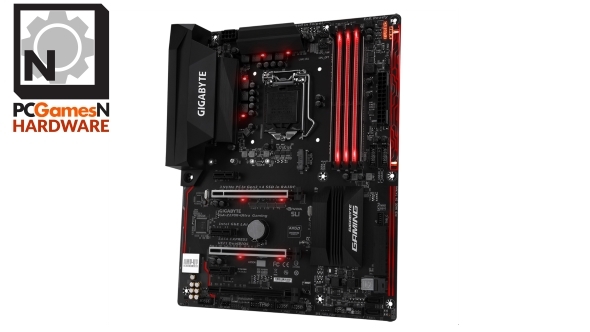 But even though Gigabyte have only opted for one M.2 slot they’ve also dropped a U.2 socket onto the board as well as a pair of SATA Express connections. On a low-cost board like the Ultra Gaming though that does seem a little unnecessary; the SATA Express interface hasn’t really taken off, nor has the U.2 connection. 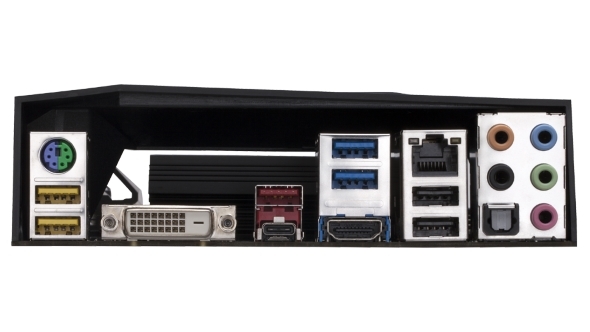 There’s another port oddity in the rear I/O panel too, with the display outputs comprising one HDMI and one DVI-D. There’s no DisplayPort socket, which is likely indicative of the parsimonious approach to the board’s extended feature set. Aside from that there aren’t really any other corners being noticeably cut. The DIMMs and PCIe slots have a welcome bit of reinforcement around them, making them a little more robust. That’s especially useful around the graphics card when a motherboard is mounted vertically instead of horizontally. And there’s also, DVI-D port aside, almost identical I/O arrangements on the rear of the board as you get with the more expensive boards we’ve tested. If you were expecting markedly weaker processor or GPU performance from this board because of its more reasonable price-tag then you ought to be pleasantly surprised. There is precious little between the Ultra Gaming and either of the Asus or MSI boards. And that’s because, where it counts in the CPU and gaming benchmarks, there’s really very little a motherboard can do to mess things up. The processor and memory tests show that, as far as they’re concerned, a Z270 board is a Z270 board is a Z270 board. It’s arguably the same with the gaming and graphical benchmarks too. There are slight, oh-so-very-slight, variances between some of the different motherboard results, but that is more down to general testing variance than anything serious. There are differences elsewhere though. The sequential storage performance is a little low in comparison with the other boards, even the cheaper-still Asus Prime Z270-P. But it was the thermal and power performance which threw up the biggest testing discrepancies. The Ultra Gaming displayed the highest peak CPU clockspeed of all four of the Z270 boards I’ve tested so far, hitting 81°C with the Core i7 running at its stock clockspeeds. It also showed the highest peak power draw too, one making sense of the other. In real terms there’s actually not a chasm of difference between the MSI Gaming M5 and this Gigabyte on that front – the MSI too seems to run thirsty and run hot, though not quite to the same extent. That hasn’t affected the Ultra Gaming’s ability on the overclocking front, however. I was still in the exact same situation as with the other boards – a 5GHz boot with my 7700K sample, but only a 100% stable 4.9GHz overclock. That is a processor limit, not a chip being lmited by its surroundings. With the lack of any real processor or gaming performance differences between any of the Z270 motherboards I’ve tested it would be tempting to suggest that, so long as it’s definitely rocking the Z270 chipset, you should just go for the cheapest board you can find. 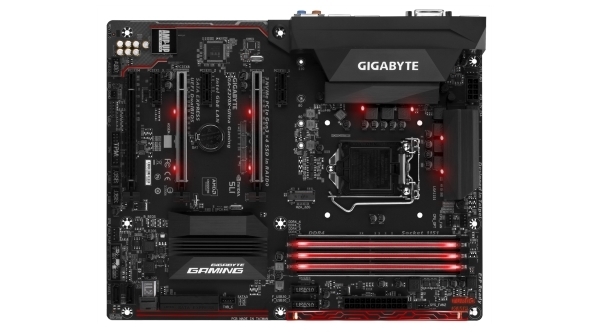 Even this Gigabyte board – almost $100 (£100) cheaper than the Asus TUF Z270 Mark 1 we’ve been using as part of our Kaby Lake testing platform – still has a decent feature set and the gaming performance to match. I’d also favour better power circuitry too. The extra power this board generates isn’t going to bankrupt you, but there is almost a 10°C difference between the peak operating temperature of the 7700K in this board compared with the Asus TUF. Eventually that extra heat is going to tell on your expensive silicon. That aside the Z270X-Ultra Gaming quite capably treads the fine line between price and performance needs. The $50 (£50) difference between the MSI and Gigabyte options seems pretty unnecessary when it comes to the overall performance of the two boards, but if you were looking for a board to house your permanently overclocked Kaby Lake chip I’d have to go for the much cooler Asus board.